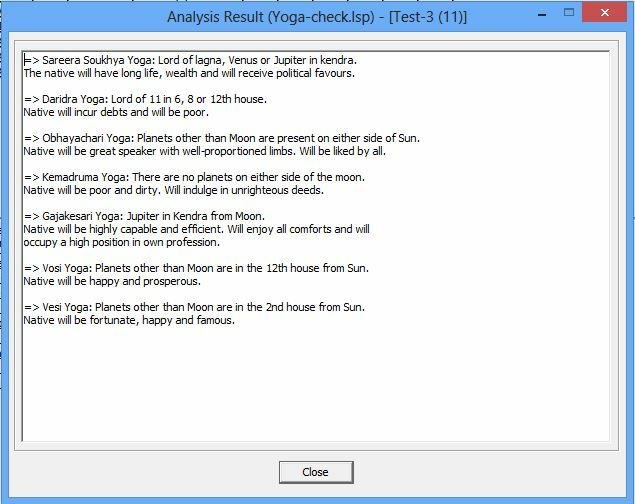 KPAstro™ is a Windows-based astrology software with support for a specialized system of astrology called Krishnamurti Padhdhati (KP). The system has followers all over the world. KPAstro™ was first released in late 2004 and has grown steadily in functionality. The current version (Version 4.1) supports Lisp scripting to facilitate complex astrological conditions to be identified, and to perform intelligent chart analysis. For some years prior to the current release, we were experimenting with Lua as a scripting language. Finally we chose Lisp because of its rich tradition, uniform syntax and compilability. KPAstro™ is written in C++, and the Lisp scripting engine is loaded as a DLL when needed. Scripts can be in source or compiled form (.ofasl). An astrologer who uses KPAstro™ might wish to search his huge database of clients for those that match a specific astrological profile. Suppose that he wishes to locate all clients in whose chart a planet is its own sign lord. The normal way is to open each chart and look for this condition. Such a manual search will not work when you have hundreds of clients. The same condition can be easily expressed in Lisp and can be used by the built-in chart locator to identify matching charts quite rapidly. Searching the database of clients for a particular astrological configuration. People approach an astrologer to get an interpretation of their chart with respect to education, marriage, professional career, etc. Giving an accurate reading is both art and science. 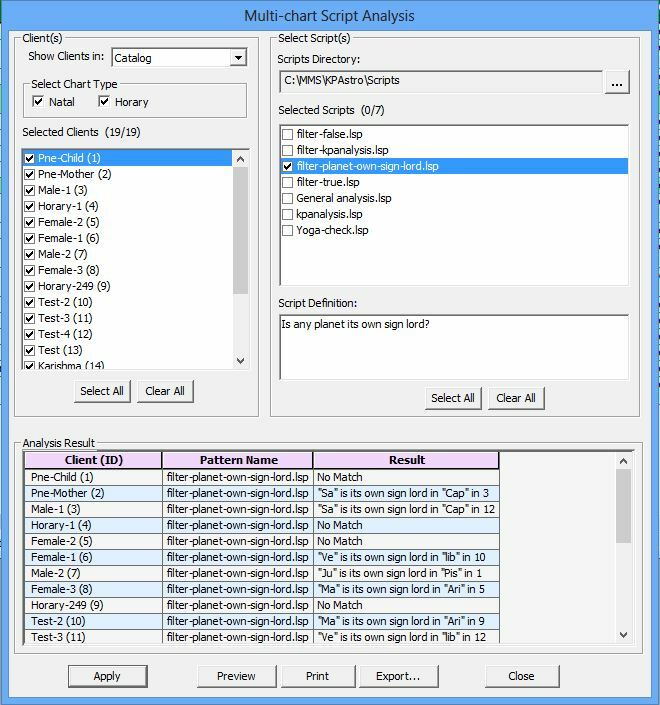 The KP system has its own rules and guidelines for analyzing various chart configurations. Lisp scripting allows us to customize this aspect. We are currently working with astrologers for encoding their interpretive skills so that KPAstro™ can be used by anyone to understand their destiny. You can write a script to determine when (i.e. on the time axis) an astrological phenomenon is going to occur. For example, we can look for the time point (this can be in the past or in future) when a planet is its own sign lord. Searching for astrological phenomena along time axis. We are greatly excited with this new release of KPAstro™ as we feel Lisp scripting greatly enhances the product's value. We chose LispWorks because of its great IDE, extensive feature set, and royalty-free distribution. At Man Machine Systems, we provide advanced training on C++, Java, Object Modeling, and Software Testing. We also offer consulting and customized software development services. Copyright © 2014 Man Machine Systems.